Ayu. 2011 Jul-Sep; 32(3): 329–332. This was a prospective observational study done at Shri Ashutosh Maharaj (SAM) Ayurvedic Treatment and Research Centre at Noormahal Punjab, India . 110 patients of recently diagnosed essential hypertension were selected to be followed-up after giving them herbo-mineral medicine containing Sarpgandha 150 mg, Jahar Mohra Khatai Pishti 75 mg and Moti Pishti 75 mg. twice a day. The objective of this study was to investigate and authenticate the clinical efcacy of a herbomineral extracts of rauwolfina serpentine or Sarpgandha 150 mg, Jahar Mohra Khatai Pishti 75 mg and Moti Pishti 75 mg. in essential hypertension. There was a decrease in average or mean systolic blood pressure-SBP, diastolic blood pressure-DBP. At end stage of this study Mean SBP was reduced by 28.1% in Stage II hypertension patients as compared to 13.9% reduction in patients with Stage I hypertension. Reduction in mean DBP was 23.4% in Stage II patients as compared to 9.5% in Stage I patients. Mean MBP was reduced by 25.5% in Stage II patients as compared to 11.3% reduction in Stage I patients. 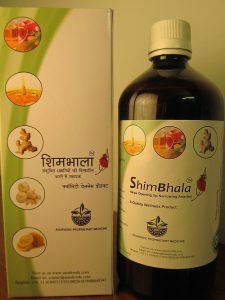 Thus the synergistic action of all these is resulting in a high efficacy and high potency anti-hypertensive remedy /Treatment with the studied extracts of rauwolfina serpentine or Sarpgandha 150 mg, Jahar Mohra Khatai Pishti 75 mg and Moti Pishti 75 mg.